Analysis: After being released by the Giants on Wednesday, all Henderson had to do was travel across town for a new job. The 22-year-old speedster showed glimpses of potential as a return man before fracturing his shoulder in November. He figures to compete for that role with the Jets. The Giants released Henderson on Wednesday, Jordan Raanan of ESPN.com reports. Analysis: Henderson was fairly effective as a return man for the Giants last season before fracturing his shoulder in November and landing on injured reserve. Though he's now reportedly healthy and ready to go for OTAs, New York appears to be moving forward with Jabrill Peppers and Corey Coleman as its top returners. The Giants placed Henderon (shoulder) on injured reserve. Analysis: Henderson fractured his shoulder during Sunday's loss to the Eagles and will now be sidelined for the remainder of the 2018 season. The rookie wideout was primarily used as a kick and punt returner. Henderson fractured his shoulder in Sunday's 25-22 loss to the Eagles, Ralph Vacchiano of SportsNet New York reports. Analysis: Henderson will almost certainly miss multiple games if not the rest of the season. Odell Beckham is listed as the Giants' backup punt returner on their depth chart, but the team could turn to Corey Coleman or Jawill Davis if they prefer to limit exposure to their star receiver. Henderson will not return to Sunday's game against the Eagles with a shoulder injury, Martin Frank of the Delaware News Journal reports. Analysis: Henderson's absence could allow Odell Beckham to play a role in the return game, but the Giants' offense shouldn't miss a step without Henderson. Henderson is considered questionable to return to Sunday's game against the Eagles with a burner. Analysis: Henderson has returned punts in each of the Giants' past four games, but he may not be available for the remainder of Sunday's tilt as Odell Beckham figures to fill in at PR. Henderson was activated to the active roster from the practice squad Saturday, Dan Duggan of The Athletic reports. 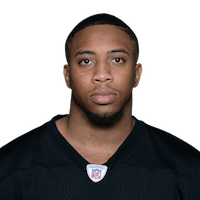 Analysis: In the last week, Henderson has been released by the Giants, signed to the practice squad, and now activated back to the active roster. Henderson will likely have his services employed mostly on special teams as a punt and kick returner. The vacancy on the roster came when the Giants released guard Patrick Omameh. The Giants signed Henderson to their practice squad Wednesday, Dan Duggan of The Athletic reports. Analysis: Henderson was waived by the Giants earlier this week, and now rejoins the team in the form of a practice squad member. Having been mostly utilized as a punt returner, it's conceivable that Henderson could rejoin New York's active roster sometime in the future if he's able to show well in his time on the practice squad. The Giants waived Henderson on Tuesday. Analysis: Henderson was promoted to New York's active roster on Oct. 21 and appeared in two games with the Giants, mostly being utilized as a punt returner. It remains to be seen if the Giants are interested in signing him to their practice squad if he clears waivers. There are no videos available for Quadree Henderson. Click here to view all videos.